Stanley calls the magnetic hook system “Tru-Zero”; they say the rare earth magnet set in the hook measures accurately every time because of the hold it has on metal surfaces. Stanley also claims the normal 3mm difference in the tape abutment process is eliminated with the new hook-and-magnet system. Coupled with the 11′ blade standout, 1-1/4″ wide blade with big, easy-to-read callouts, 16″ and 19.2″ stud center markings, and the Mylar/BladeArmor coating, it’s clearly aimed directly at construction pros. Is it worth the premium for the Tru-Zero and the magnetic tape? To pros, yes — definitely. Because we’ve seen the rest of the FatMax line, we know the strong quality behind the basic structure of the product and this is no different. We’re guessing, though, that the non-pro constituency that stills want a big magnet on the end of their tape and are willing to pay three times as much for it will be a minority. I would seriously consider buying this if I saw it and the 22 dollar price tag is high but worth it if the magnet is good and strong. I really would like to know where you are finding the nonmagnetic 25 foot fat max tape at? Thanks! oops forgot to say, where you find the other tape at 8 dollars, because I usually pay more for it in my area of Wisconsin. The Fat Max 25′ w/o the magnet is $15.97 on amazon. Thanks, that is about what I am paying for the standard one! This is a 1″ wide tape, not the Fat Max 1 1/4″ wide tape for 8 bucks at WalMart. Watch out for swarf sticking to the magnets and messing up your measurements! One of my helpers has one and this tripped him up on a job. They’re pretty neat. 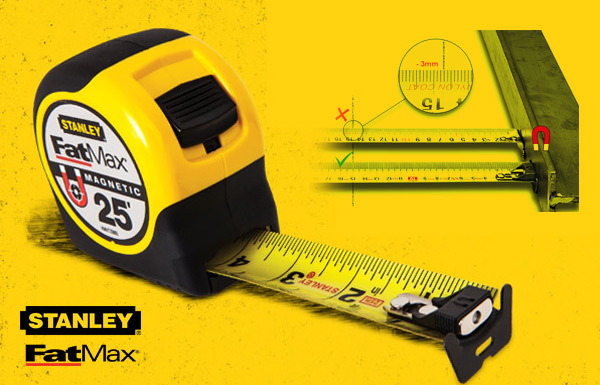 I might buy one if I have a chance to buy a second tape measure for myself in this life. Welders will happily shell out the extra money for this feature….pure genius, and will save a lot of time fussing with making sure you have the tape snugged up against a piece of metal. Interesting. A guy I worked with a few years ago made one of his own. He used a magnet from a hard drive – those are pretty strong – and epoxied it in ‘just the right spot’. I was impressed and he made one for me and a few more and gave them as Christmas – oops, said the “C” word – gifts. As was said, watch out for the extra debris that the magnet will grab. That could throw you off. The magnet could come in handy as a retreiver. Yeah, and I’d bet there will be plenty of these returned after such use because it broke lifting that 3lb hunk of scrap that fell behind the work table. That will either drive up the price, screw the warranty program or kill the product completely! If you need a retrieval tool, buy a retrieval tool!